The Boston University School of Management was founded in 1913, with the MBA program beginning in 1925. In March 2015, the school was renamed the Questrom School of Business in honor of a $50 million endowment gift from alumnus and retail industry leader Allen Questrom, his wife, Kelli, and the Allen and Kelli Questrom Foundation. Questrom successfully transformed several of the nation’s largest department and specialty stores, including JCPenney, Neiman Marcus, and Barneys New York. The school offers nine different programs related to the MBA degree. Along with the traditional full-time MBA, part-time MBA and executive MBA, students can seek out joint degrees that pair the MBA with Digital Innovation, International Relations, Economics, the Health Sector, Social Impact, Manufacturing and the Juris Degree. The school is fully accredited by AACSB International. Boston University’s central campus is located right next to Kenmore Square, a central intersection in Boston, only two miles from downtown. The main campus is less than six miles away from Boston’s Logan International Airport. The Boston University Questrom School of Business is housed in the Rafik B. Hariri Building. Opened in 1996, this six-story building includes a 375-seat auditorium, classrooms, faculty offices, computer labs and three separate lounges for undergraduate, graduate and EMBA students. The building was originally designed to accommodate 1,700 students, but now welcomes 3,500 undergraduate and graduate students. Also in the building are the Feld Career Center, the Fredrick S. Pardee Management Library, a delicatessen and a coffee shop. The Boston University Questrom School of Business has more than 100 part-time faculty members who are distributed across sixteen schools and colleges. Faculty members also contribute their research to BU’s Questrom eight centers and labs, which cover topics including health policy, global business practices and nonprofit leadership, among others. There are currently 1,013 students enrolled in the Boston University Questrom School of Business MBA programs, with 320 full-time and 646 part-time students. 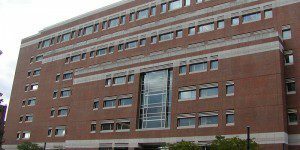 The Questrom School of Business supports several programs for completing an MBA degree. In addition to its full-time, Executive, and part-time, BU offers a Health Sector MBA and a Social Impact MBA, as well as several dual degree options.